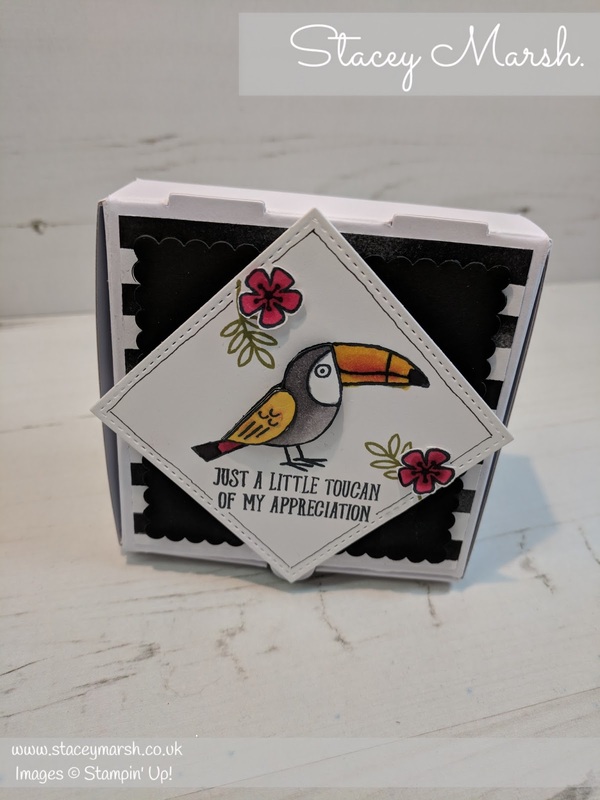 When we attended the most recent Stampin' Up! On Stage event, we were able to preview the brand new Spring/Summer and Sale-a-Bration catalogues which was not only just a little bit exciting but ALOT exciting! When you attend these events, not only are you given an amazing goodie bag full of exclusive branded merchandise, throughout the day you are given free product including stamp sets! 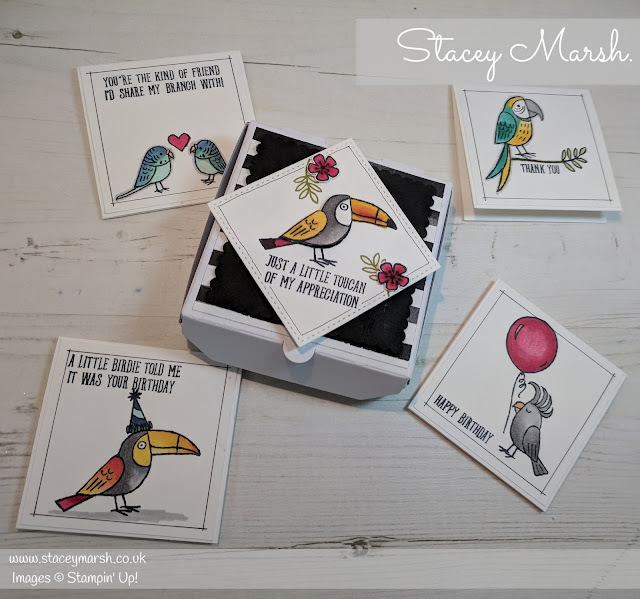 The set that I have used today is called Bird Banter and was one of the wonderful give aways in November and it was one that so many people fell instantly in love with and you may have seen these little birds on the web bought to life with colour! 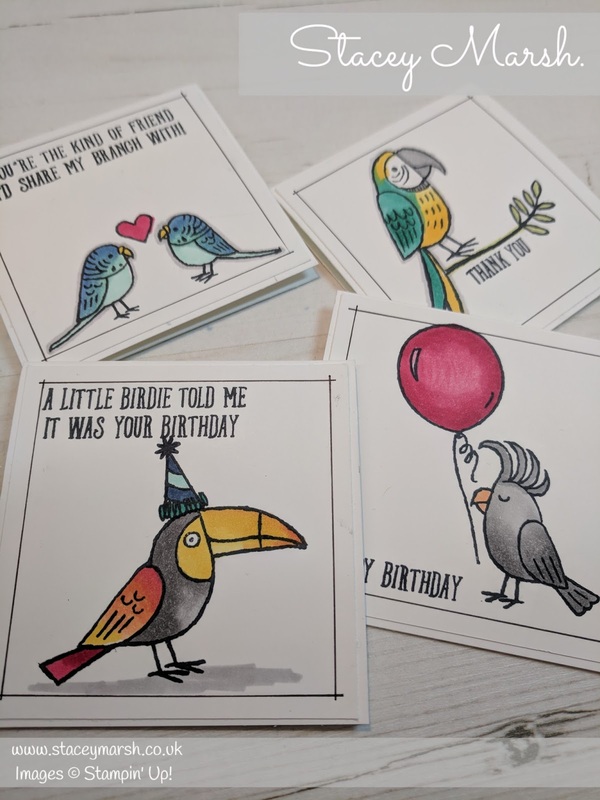 I couldn't choose which one to use for the focus of one card, so I have made a whole set of cards using them all! The cards measure 3" x 3" I have placed them inside one of the Mini Pizza Boxes that I have put together. These boxes were released in the 2017 Autumn/Winter catalogue and I am so pleased that they have not been retired! They hold the Whisper White 3" x 3" Envelopes perfectly and make for great little gifts! On each card, I have stamped each bird along with an extra 'item' and coloured with the new Stampin' Blends which are just perfect for colouring these little guys as they have a fine-nib option for intricate colouring! Just another reason to love the blends! For the outside of the box, I have used some DSP from the Petal Passion Designer Series Paper collection along with a scalloped square shape of Basic Black cardstock which has been cut using the Layering Squares Framelits Dies and the large sqaure from the Stitched Shapes Framelits. I really enjoyed using this set, and I'm sure it won't be the last time that you see it here!